The nearly 7,000 kinds of grasses make up the most widespread plant family in the world. Grasslands range from mowed lawns to idle fields to grainfields. Before settlement, grasslands of several types were scattered throughout the US and Canada, such as wet meadows, oak and pine barrens, dry sand prairies, and tall grass prairies. One grassland that most people think of is the tallgrass prairie, which was primarily a Midwest ecosystem that extended into southwest Lower Michigan. These prairies were unlike anything the settlers had ever seen, and they supported more than 300 species of wildflowers and grasses, some of which grew to a height of nine feet. Many experts consider North American grasslands to be a fairly recent development in geologic time. Thousands of years ago, huge glaciers covered much of the northern US and Canada. About 14,000 years ago, the climate became warmer and the glaciers began to melt and retreat. Prairies, barrens, and wet meadows began to establish themselves on landscapes that were level or gently rolling on sandy or loamy soils. After the glaciers were gone, the climate cooled and the conifer forests appeared. Vegetation changed over the next several thousand years with warmer, drier periods favoring grasslands in sandy and loamy channels, rolling hills, and flat lakeplains, and the spread of oak and hickory. Perhaps as important as climate is the element of fire to establish and maintain grasslands. Whether caused by lightning or set purposely by Native Americans, fire helped prairies to grow by stimulating grass and wildflowers to reproduce, reducing competition from weeds, and discouraging the encroachment of shrubs and trees. No one knows exactly how many prairies existed in Michigan before settlement, but researchers have identified 39 known prairie areas, mostly in the southern Lower Peninsula. These prairies ranged in size from less than 100 acres to 25 square miles and may have totaled approximately 2.3 million acres. Grasslands support a variety of wildlife species. In fact, some kinds of birds cannot live in any other ecosystem. Northern harriers, sharp-tailed grouse, upland sandpipers, bobolinks, and savannah and Henslow's sparrows thrive best in grassland habitats of at least 100 acres. Grasslands smaller than 50 acres will attract bobwhite quail, bluebirds, red-winged blackbirds, American goldfinches, dickcissels, common yellowthroats, and vesper, field, and song sparrows. Other species, such as the Eastern meadowlark, grasshopper sparrow, and sedge wren, can prosper in grasslands from 10 to 20 acres. Mammals also find grasslands valuable, such as the meadow and prairie vole, 13-lined ground squirrel, and badger. Because grasslands provide nesting, brood rearing, and roosting cover, they are important to quail, pheasants, and wild turkeys. Pheasants in particular also find native grasses such as switchgrass, Indiangrass, and the bluestems suitable for winter shelter because the grasses stand up to snow. Deer use grasslands for food at birth to their fawns there. Rabbits raise their young and find food and security in grassland edges. They are also home to mice, shrews, voles, some kinds of snakes, and a host of avian and ground predators including hawks, owls, raccoons, skunks, opossums, foxes, and coyotes. When you evaluated your land, as explained in the Habitat Planning section of this manual, what grasslands, if any, did you find? If you own a native grassland, consider yourself lucky. You may be able to restore the grassland to full productivity by eliminating as much competition as possible and then interseeding desirable plant species. Or you may own an old field that was once in crop production and is now left idle. Field borders, old fencerows, farm lanes and other corridors, and odd areas that can not be plowed or disked offer further opportunities for grassland establishment. Your active hayfields are a type of grassland, too. They can be managed for livestock forage and wildlife. The current quality of your grasslands will depend on soil and water conditions, and plant composition. Each combination may attract different wildlife species. This Grassland Management section has chapters on warm season and cool season grasses, grass planting, converting old fields to grasslands, restoring a prairie, and prescribed burning. What follows is an overview of each. There are two basic kinds of grasses--warm season and cool season. Wildlife thrive in both. Warm season grasses are usually referred to as prairie grasses and include Indiangrass, big bluestem, little bluestem, switchgrass, and prairie cordgrass. They grow best under the heat of a summer sun followed by warm nights. You can see them mixed with colorful native wildflowers at public and private prairie areas and sometimes along roadsides and railroad rights-of-way. Besides their value to wildlife, warm season grasses can provide foragefor livestock and add beauty to the landscape. They are four reasons why wildlife biologists usually prefer warm season grasses for wildlife cover: (1) they hold up to the elements, (2) they are native, (3) they can be planted along with wildflowers, and (4) they live a long time. Often called bunch grasses because they grow in clumps, these plants do not break down easily under heavy winds or deep snow. Their disadvantages are that they are initially more costly to plant than other types of grass and typically take up to three years to establish. Patie-nce is the key to success. Once native grasses take hold, however, they need little attention and will live many years through proper maintenance. Maintaining them through prescribed burning every few years will keep them healthy and productive for wildlife. Other management options include light grazing by livestock, periodic mowing, or the spot application of a selective herbicide . Most of the grasses you see are cool season grasses not native to the state. These include brome grass, timothy, and orchardgrass. Native cool season species include Canada wildrye, redtop, and June grass. Alfalfa and clover are cool season legumes that are planted with cool season grasses because the legumes fix nitrogen for themselves and other plants, provide food for many kinds of insects, and offer habitat diversity for wildlife. Cool season grasses and legumes grow best when the daytime temperatures on spring and fall days reach 65 to 75 degrees Fahrenheit followed by cool nights. Cool season stands are valuable to wildlife because they provide nesting and cover in spring and summer and sometimes roosting cover in summer and fall. 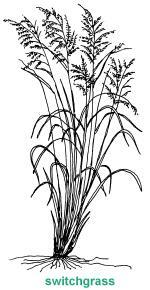 Most landowners are familiar with these grasses. Advice on planting and equipment are easy to come by, and the stands are easy and more affordable than warm season grasses to establish. Annual mowing will keep them productive although the stands lose vigor over time and may need to be replanted. They also tend to break down under wind and snow. What should you plant, and where should you plant it? Consult your overall Management Plan before deciding to plant cool season or warm season grasses. Many landowners whose goal is to provide year-round habitat for pheasants, quail, and grassland songbirds plant both types side by side, along with a nearby food plot containing corn, buckwheat, millet, and sunflowers or a similar mixture of preferred wildlife foods. However, warm season grasses should be planted before cool season grasses to ensure full stand development. If your property is small and you are able to provide only one component of habitat, consider working with neighbors who might be willing to furnish other needs. Planting more than one kind of grass will provide the variety of grass heights and density for good nesting habitat, especially for waterfowl, pheasants, and songbirds. Mixing in legumes in cool season plantings and wildflowers in warm season stands will encourage insects, which in turn provide food for wildlife. Stiff-stemmed legumes and wildflowers provide perching sites for meadowlarks, sparrows, and other birds. The wildflowers offer a source of nectar for hummingbirds and bee species. What species of grasses, legumes, and wildflowers you establish depend on soil type, depth, texture, and fertility. Certain grasses and legumes grow better on dry sites, and other types thrive on wet sites. Warm season grasses, for example, tend to grow well on sandy, droughty, or excessively drained sites. Most cool season grasses perform better on well-drained soils of sandy loam. Besides soil considerations, other site conditions include drainage and erosion concerns and potential weed problems. Check with your Conservation District office for a Soil Survey map, which will identify erosion potential as well as soil types on your property. Identify plants already growing on the site you are considering for grass planting. Also learn what you can about the history of cropping or other land use. This information will help you to know what to plant and how much effort will be needed to maintain the grassland once it is established. To increase the value of grasslands to wildlife, especially smaller sites of five to 20 acres place them next to or near other suitable grassland habitat. Examples are hayfields, pastures, and wetlands. Your grassland will help wildlife the most if the landscape around your property is also in grasslands or associated habitats. The best defense against predation is to plant a large grassland area rather than a small one. Ten acres is better than five acres, and 20 acres is better than 10 acres. If a larger planting is not possible or practical, you can help protect nesting birds from predation by edge-loving raccoons, hawks, opossums, and skunks, and parasitism by brown-headed cowbirds by placing the grassland at least 50 yards from hedgerows, woodlots, and dead trees. The buffer between these habitat types can be planted to shrubs. The shape of the grassland planting is also important, especially small grasslands. To reduce predation, plant in circles or squares rather than in linear strips. Idled farm fields, borders and corridors can often be converted to grasslands if the site and soil conditions are favorable. After those determinations are made, you will need to identify what stage of natural succession the field is in. What is currently growing there? Are the plants annuals or perennials? Have shrubby plants like dogwood, blackberry, and sumac already begun to invade? Are there any trees? If so, what kind? Before converting an old farm field to a grassland, you must eliminate the existing vegetation. Burning, mowing, disking and the application of selective herbicides are all methods used to return an old field to bare-soil conditions. Old fields may not be as beneficial to some grassland species as planted prairies; however, they, too, provide food, shelter, and security for many species. Pure prairies are ecosystems that are relatively free from the invasion of shrubs and trees. They occur where sites are too wet or too dry for woody vegetation to grow, or where plant succession has been checked through fire. If you have a prairie on your property, chances are it will be a prairie remnant that is degraded, but that might be restored. Doing some detective work at the local library and the county Conservation District office may turn up clues such as historical photos. Talking to neighbors and former owners may yield more information. Armed with a good identification guide of native grasses and wildflowers, you might be able to identify remnant prairie plants. Or perhaps a local expert will walk your property with you and help with identification. If you have a former prairie and want to restore it, you may need to remove shrubs and trees, by mowing, burning or herbicide use. In some cases you may be able to interseed the site, preferably with seed from native plants from the immediate area or begin a new planting altogether. Excessive weed growth is the biggest hurdle to establishing a lush grassland that has maximum benefit to wildlife. Native grass plantings in particular may take three to five years to dominate the site, especially if weeds were not controlled during the first year after planting. During that first year of life, native grasses grow mostly below the ground as their root systems develop. Because little growth appears above ground where weeds are likely rampant, many landowners become needlessly discouraged. Once the stand is established, though, periodic burning will keep it healthy. Other methods to maintaining grasslands include strip mowing in alternating years, light grazing by livestock, and spot treatment of problem weeds or invading shrubs with a selective herbicide when necessary. A prescribed burn is a fire purposely set to achieve a predetermined objective. Prescribed burns are often used today to kill or set back the growth of undesirable vegetation such as woody plants or noxious weeds and to promote the regrowth of warm season plants such as switchgrass. Most burns take place in the spring, however depending on what you hope to accomplish a fall burn may be in order. These fires need to be conducted by individuals who are trained and experienced in fire management. Before prescribed burns take place a burn plan has to be developed and burning permits secured from the local fire authorities. Safety from personal injury and damage to property is always the first concern when planning a fire. In summary, grasslands are important ecosystems for many species of birds and mammals. Whether you restore former grasslands, convert old fields, or create new grasslands, patience is one key to success. Another key is regular maintenance, to control natural succession. The benefits, however, include providing valuable wildlife habitat, livestock forage, and landscape diversity that is pleasing to behold.